0 Comments | Posted by admin at 6:38 am. Leave a comment! I loved the recent statement made by the President of Academy of Nutrition & Dietetics (formerly known as American Dietetic Association), Ethan Bergman. He said “All Registered Dietitians are Nutritionists but not all Nutritionists are Registered Dietitians”. Although registration is not yet mandatory for all practicing dietitians in India, it’s only a matter of time for this to happen. 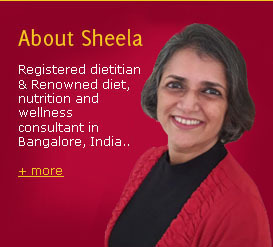 Basically the registration process separates the qualified dietitians and nutritionists from the quacks, semi-qualified and unqualified ‘nutritionists’. This difference can matter a lot to the health and well being of the public. If you need professional help with your food / diet / nutrition, approach a qualified person. 0 Comments | Posted by admin at 4:25 am. Leave a comment!